If you were watching at home you got a big shock when the original titles and theme began at exactly 7:50 pm. A perfect intro to such a special you can’t argue with its instant effect of putting you right in the mood for celebration. As we see Clara with a new job at Coal Hill School receiving a message from ‘her doctor’ the ride, (on a motorbike, naturally), is only just beginning. Indeed, when the Tardis gets picked up by Kate Stewart by Helicopter with its residents still inside and clinging on for dear life, the most filmic element of the whole thing begins. It’s hard not to love those aerial shots of the Thames with the Tardis in the foreground and makes for one of the most iconic introductions to the series thus far. Fan or not, you can’t fail to have been impressed. As the special continues, with references to the series past and present aplenty you can’t deny that a bit of back story knowledge is needed but it flows so well even the casual viewer will get swept along with the action happily. 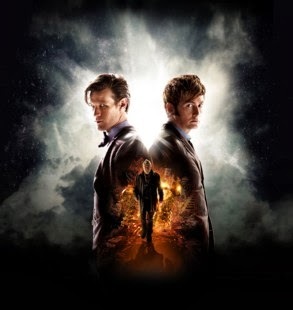 The return of Tenth Doctor David Tennant and the introduction of The War Doctor as portrayed so well by John Hurt plus our soon to depart Eleventh Matt Smith is a trio that works well together. Poor Clara gets not a lot to do really but in a Time War based story such as this that is perfectly understandable, with even the Zygons forgotten about by the time the films stunning conclusion comes. The cameos from Tom Baker and (an uncredited) Peter Capaldi are worth the watch alone with the final scenes reset of the series mythology making for much thought on the direction future seasons will go. But on first watch it was all rather a lot so a second viewing was in order. Our second viewing was at a packed screening in our local cinema, full of people wearing paper masks of previous Doctors and monsters and a lot of stripy scarves. Were we here for the premier many more would have been present but for an encore showing it was a very full room. The atmosphere was tangible despite the level of knowledge already out there and when the lights went down we got a surprise or three. First up, a warning from Strax to puny humans about ‘unruly cinema practises’ and then a warning from Doctor’s Eleven and Ten about Zygons in the building. Then came that Delia Derbyshire theme and we were in for a treat; 3-D has its detractors precisely for being used inappropriately or as a gimmick but that is not the case for this presentation of Day of the Doctor. What looked excellent on the television screen looked superb on the big screen with the Time War sequence particularly benefitting from the 3-D treatment. The second view was most definitely the definitive one for this reviewer. And Tom Baker, with his wide eyes and instantly recognisable voice is still surprising and very much a highlight. 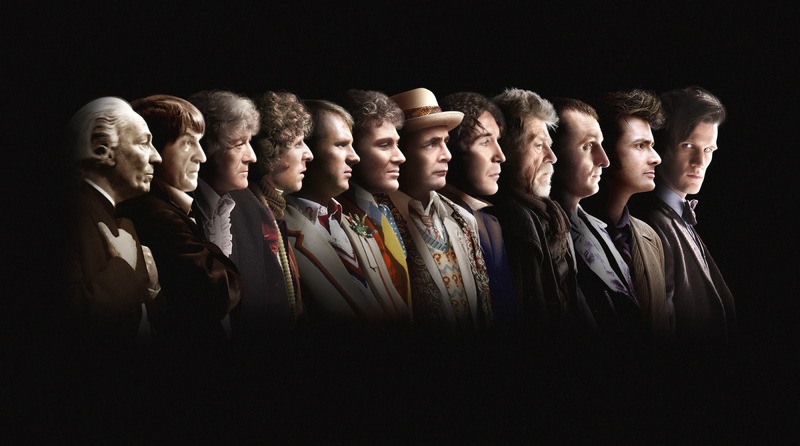 A rewatch of the biopic An Adventure in Space and Time also proves without a doubt that it’s a gem. But with so much coverage there had to be some failures somewhere and the BBC3 After party was, despite so much promise and some great interviews, somewhat lacking. But the positives of the whole week of programming include the remastered print of An Unearthly Child, The Science of Doctor Who and the absolute highlights An Adventure in Space and Time and The Day of the Doctor. A good birthday indeed by anyone’s standard!